Alumni—whether former students, colleagues, or volunteers—can be our strong sources of strategic advantage if we keep them in our community and continue to draw on their talents. The power of alumni has even risen to the attention of international statecraft. It is a shame to overlook it in our civil society where we create some of the most lasting and meaningful human connections. Fulbright Exchanges, the Alliance Francaise, the Confucius Institute, the British Council and the Deutscher Akademischer Austauschdienst: all are efforts to build understanding and relationships across borders. The scientific and cultural ties they create are meant to foster a common culture and beneficial collaboration among leaders in different countries and to avoid the horrors of mass conflict that punctuated the 20th century. These efforts are examples of “soft power,” a term coined by Professor Joe Nye at Harvard. In contrast to the hard power that compels others through military might or economic sanction, “soft power” attracts others to affiliate, join in, and participate in a community of mutual trust and shared principle. Professor Nye points to the UK as a middle-sized power with a middle-sized economy that punches way above its weight in terms of soft power—through its institutions of higher learning, its globally distributed movie and music creations, and even its constitutionally constrained royalty whose celebrity lifestyles and good works capture the imaginations of publics across the globe. I had the privilege of participating in conversations with UK authorities as they sought to nurture positive feelings toward the UK in East and Southeast Asia, where their universities have large numbers of influential alumni but not the levels of resources needed to cultivate them. The authorities wondered how they could help UK universities better engage their alumni and also how to transfer the warm feeling toward their alma mater to benefit their nation. Alumni are the key outcomes that colleges have in the world. But if we only measure what graduates have accomplished with their degrees, we miss the larger opportunity to keep them engaged with their alma mater. We also miss the opportunity for them to engage with each other, and to build on the shared educational experience that not only helped improve their skills and knowledge but also often forged who they are and the content of their characters. Alumni are the carriers of soft power for our schools, colleges and universities. But the alumni experience is not limited to educational institutions. Organizations that live and thrive based on their ability to attract and retain talent should all be engaged with their alumni, broadly understood to include former donors, volunteers, board members, and employees. Look at one of the leading business consultancies, McKinsey and Co. Their alumni network of former employees features prominently in the company’s recruitment of some of the best and brightest graduates from top universities around the world. Of course, this network also helps with business development and in staying atop trends, which plays a direct role in maintaining the analytic edge that commands a premium in the business consultancy market. In the education sector, we have many exemplary alumni relations programs where spirit, loyalty and engagement are strong. Yet there are just as many organizations who feel that because their sports teams are not on television, or that they do not have “formal” alumni, or—name your rationale—they don’t have the means to stay engaged with former colleagues who are no longer an active part of their operational every day. Think of long-standing institutions that have made significant contributions to shaping our world, as they recount their histories with pride. Look to see how they marshaled that most important asset of meaningful relationships, and how they kept the talent flowing to grow, prosper, and inspire. They tend to stay in touch with the talent they nurtured and continue to engage it in meaningful ways. Many of us know that the relationships we have with our employers, employees, customers, and community are precious assets. Yet how often do we devote the time and energy to pursue the long-term soft power of our relationships? Too often we allow ourselves to be ruled by the tyranny of the present and the hard power needed to address immediate operational challenges. In the long run, it is the alumni we create that reflect our strength as an institution, and keeping our focus there is the abiding challenge. Drafting blueprints as an undergrad, LaDaniel “Danny” Gatling II had no idea he’d build more scholarship funds than buildings, or that his career path lay in the direction of fundraising and philanthropy. Working as an architectural engineer after graduating from North Carolina A&T, Gatling found he was a “people person,” so he moonlighted in insurance and thought he had found his niche. Financial advisor roles ensued, leading him to join Merrill Lynch as a financial consultant, where he teamed up with the firm’s philanthropy group to work with high net worth clients and their educational institutions. “And that’s where I got the philanthropy bug,” he says. He met higher education development officers, and the job appealed to him. As the dot-com bust hit Wall Street, his alma mater launched a campaign. He joined the development team and found a profession he loves. While working at North Carolina A&T, Gatling earned a Certificate in Fund Raising Management from The Fund Raising School through a grant program for HBCUs supported by Lilly Endowment. That whetted his appetite. “I’d been thinking about a master’s degree, and the Executive M.A. in philanthropic studies at IU really helped me out. I could do it from North Carolina without leaving my job,” he says. 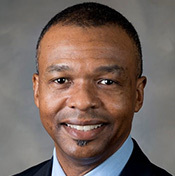 Gatling has earned executive fundraising roles at several institutions, including associate vice president for institutional advancement at Bennett College and associate vice president for philanthropy at Guilford College. He currently serves as assistant dean for development at the Elon University School of Law in Greensboro, North Carolina, where he is helping the new school create a fundraising program. Learn about the Executive M.A. and apply now! Derrick Feldmann is leading a movement to get people thinking differently about social movements. The master’s degree alum is founder and president of Achieve, a research and campaign agency for companies and causes. 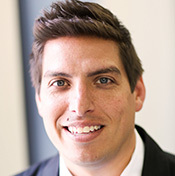 He’s best known as the creator of The Millennial Impact Project, a multi-year, ongoing study of how that generation supports and redefines causes, and founder of the MCON national conference on Millennials and social good. Helping other generations understand Millennials sparked Feldmann’s desire to help people of all ages and backgrounds understand people they’re not familiar with, connecting them with each other and with causes aimed at social change. “This is where I feel I can best play a role in making a difference,” he says. A self-described “curious guy,” Feldmann says many in the philanthropic and nonprofit sector aren’t curious enough. “We don’t spend enough time understanding the ‘why.’ It’s one thing to do the work and another to question why we do it and why others get involved in it,” he says. “ ‘Why’ is where the Lilly Family School of Philanthropy thrives, and it’s a major reason that I chose the M.A. program in philanthropic studies there. For lots of students, spring break means getting to do what you want to do for a week. For Caily Wolma Lee, a B.A. alumna who’s now a development associate for the Indianapolis Symphony Orchestra (ISO), it meant getting to do what she’s always wanted to do with her life, even if she didn’t always know exactly what that was. During her freshman year at Indiana University–Purdue University Indianapolis (IUPUI), Lee signed up for an alternative spring break, volunteering with Habitat for Humanity in Elizabethtown, Kentucky. She built sheds and a wheelchair ramp, rescued salvage building materials, and met Derek Dixon, who was then a student in the IU Lilly Family School of Philanthropy. He told her she should check it out. “So I started taking classes and I loved them,” Lee says. “I wanted to choose a career that let me express my values and beliefs daily, and my faith is a big part of that. It was important to me to find a job I was passionate about, something I could really care about that wasn’t just a job. “Before college, I knew I was interested in working in a nonprofit but I didn’t have a dream cause and didn’t know what type of role I would like, but I didn’t think I’d want to work in development." Still, when she heard about a development internship at ISO through one of her courses during her junior year, she decided to keep an open mind and applied. “Once I saw how development really works—that not everyone who works in fundraising is a solicitor and how many different roles and options there are in a development department—my eyes were opened,” Lee says. During her summer internship she assisted with cultivation and stewardship of the symphony’s corporate donors, served as an on-site resource for sponsors of Symphony on the Prairie, and worked on a newsletter for the young professionals group. The opportunity struck a chord, and Lee asked to continue on a part-time basis for the fall semester. When an unexpected, permanent job opening occurred, Lee applied and won the position after a rigorous application and interview process, securing her first job out of college before graduation. Lee credits her bachelor’s degree program with helping her prepare for the role. “The coupling of the liberal arts basis and experience in the field is really special. Knowing the motivations for giving and having that balance of theory and practice is very helpful,” she says. Today, Lee loves her job at the symphony, which she says is exciting and fun. It includes event planning for several different types of donor events and other special events, implementing communications, donor retention and new donor acquisition strategies for those events, and continuing to work with Symphony on the Prairie. 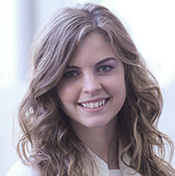 And this summer she will pay it forward, supervising a summer intern from the Lilly Family School of Philanthropy. In 2008, Lijun He was working in China on an international project with the European Union designed to bridge the two societies. In the process of that work, she met people who cared deeply about civil society issues and who were inspiring civic leaders. She determined to learn more about civil society and philanthropy and to do something in the field. That same year, the idea became personally relevant: Lijun’s hometown of Sichuan experienced a devastating earthquake. Observing and participating in the response, she thought that China’s civil society could benefit from more professional skills. She also wondered why so many people volunteered for disaster relief and donated to the relief efforts. Soon after, she attended a lecture by Dr. William Plater, then director of the Workshop for International Community Development at the Center on Philanthropy, when he visited Sun Yat-sen University in Guangzhou to give a lecture on philanthropy. Lijun’s background in literature gave her an appreciation for the Center’s focus on philosophical inquiry with an applied focus on practical implications. That led Lijun to study in Indianapolis. She completed her M.A. in philanthropic studies in 2010 and her Ph.D. in 2015. Looking back, the journey exceeded all her expectations and provided her with a rich liberal arts foundation of philanthropic studies—particularly the history and philosophy of philanthropy. “I originally thought I was coming to learn concrete skills, but my time at the school transformed me,” she says. Interning at the Nina Mason Pulliam Charitable Trust, she learned about grant making. Interning at the American Red Cross, she learned about fundraising—not only the hands-on skills, but the leadership qualities important to being a successful fundraiser. Interning at The International Center, she learned about programming. Throughout, her goal was to have additional credibility when she returns to China someday. For now, she is still in the United States with a faculty position at Pace University, but continues to do research on Chinese philanthropy. She also created a blog so she could target the right populations with the ideas she wants to discuss. Written in Chinese, there are currently 1,500 subscribers, including foundation leaders and philanthropists. She uses the blog to exchange ideas with Chinese leaders and discuss case studies and current issues. 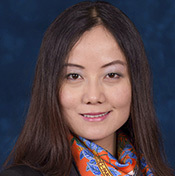 As a new faculty member tasked with teaching fundraising her first semester, Lijun knew she was on the right track when she was handed a copy of Achieving Excellence in Fundraising, edited by faculty at her alma mater. In addition, she teaches statistics and core courses in the Pace University M.P.A. program’s nonprofit track at the Dyson School of Arts and Sciences, as well as a course on research methods. “There is a big need everywhere for this field,” she says. What’s next? “Become an excellent researcher!” Lijun’s training, work experience, and international background position her well to be an international scholar. She is also interested in doing research on U.S. foundations’ strategic shift to impact investing and the management strategies of foundations; there is not a lot of real research on these topics. 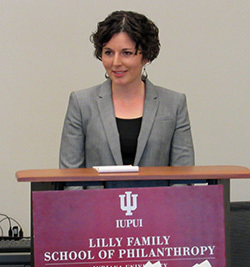 She also hopes to continue research on both Chinese philanthropy and Chinese philanthropy in comparative context. Longer term, she wants to gain tenure—she enjoys the intellectual stimulation and the process of creating and disseminating knowledge.